There are thousands of hair salons, so I shall only review a few high class ones. Given that I am not a lady, I can not experience the joy of actually having my hair styled, so you will have to do that for me. 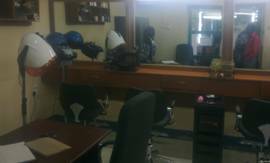 This is the biggest and best stocked Salon probably in Eastern Africa. It opened in January 2011, it has 10 separate areas: the reception, a waiting room, the lounge, a barber shop, the gym, a sauna, massage room, wash rooms, before you get to the beauty room and finally the hair salon! At the entrance are two staff behind a decorated welcome desk. Around are several cabinets of perfumes, cosmetics, lotions, hair products and nail polishes for clients to select before their services. On the left is the waiting room has colored settees for relaxing. To the right is a lounge with a huge glass front fridge with soft drinks and lockable boxes where clients can store their jewelry and valuables. 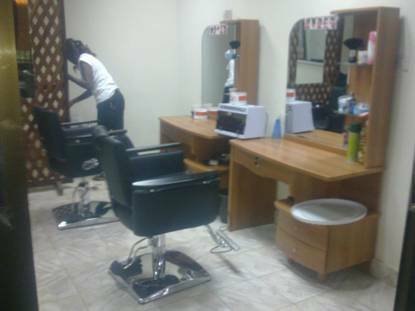 Further on is a beauty room with two beds for facials, a barber shop with eight stations, changing rooms and toilets, a small gym with a few equipment for ladies, a massage parlor and a hair salon that can cater for twenty ladies. The extensive price list is well displayed at the reception and they have a colorful brochure with all the range of services. It is located just behind the ministries, on the main road opposite the rear entrance to the Parliament, who may be their target clientele. The Sahara Concept Salon is owned and operated by a very industrious Naigerian lady who lived in the U.K.. She imports her machines, equipment and products from Europe, UK and USA. There are four separate sections, hair, barber, beauty and massage. There are around 4 ladies and two gents assisting clients. Clients are offered wine, coffe, tea or snacks while waiting in the airconditioned rooms. There is soft music and a t.v while you are being pampered. The mens haircut is from 20 pounds, and after that you get a very soothing head massage. The full body massage is 70 pounds for ladies and 100 for men. They also have massage machines as well as swedish massage. Pedicure and manicure are offeredat 30 to 50 pounds. There is expert skin consultation with hi frquency facial machine. There is a steam aromatherapy tube for body steaming. Human hair weaves with imported human hair will crown you. In addition there is waxing, dreadlocks, plaiting, chair massage and many other services. There are also west african clothes on sale Call 0955 155083. The Home and Away salon is in the Home and Away complex. 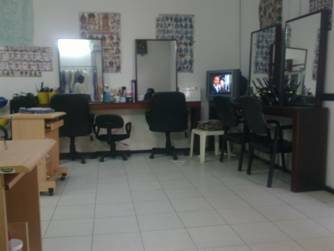 They offer hair, nails and beuty services including weaves, perm, haircut, waxing, facials, manicure, pedicure in a clean air conditioned room. They also have two barbers for men. The next room is a clothing boutique. In the same compound are two restaurants and two bars as well as a dry cleaner and conference, so is convenient for the family. It is on State House road so is frequented by the who’s who. On the main Thong Ping road, they are well known for Caucasian hair. The barbers are Indian and well versed in European and American hair styles. There is a separate salon for ladies as well as a separate barber room. Next there are also a clothing boutique, massage parlour and a beauty room. .
On the main Thong Ping road, in ffront of Airport View Hotel. They offer all hair, nails, skin and beauty services. It is larger than the other two above and very busy, with a high class service but value for money. Also on the main Thong Ping road, inside the Smart Camp business center. This was one of the original barber and salons. They renovated and expanded in 2011. They also moved from the first floor to a larger space on the ground floor. They offer all hair, nails, skin and beauty services. They have a separate barber room with three to four barbers. They also offer professional massage at 80 pounds per hour. You can have a beer and roast goat meet while waiting for your turn. on Thong Ping road there is a small but very clean and new barber shop, pictured here. There are a few beauty product shops on the main road in the Malakia area but the best with the most products are deep in Konyo Konyo market or in Jebel market. I advise you spend the afternoon going through these two markets as there are thousands of small stalls with a big variety of products. The cleanest and largest barber shops are located mostly in hair salons. See the above list for the best barbers. Sahara give a haicut for 20 pounds, then a different lady washes your head and gives you a relaxing head massage. Home and Away, Thong Ping Business Center Salon, Airport view salon are other good places. There are many other barber shops as well as smaller barber kiosks, which will charge you five pounds for a haircut. All have the same range of equipment, so chose the one closest to your hotel. They charge around 20 pounds per session. In addition hotels like AFEX, Beijing, Panche and Oasis have gyms for guests only. There are several more under construction, like Asante, Chez Solomon, Nimule, etc, etc. Sahara Hotel is near city center, has two masseuse in their beauty parlor behind the barber shop. They charge 100 pounds due to location. Rock City is far out of town but has currently the most popular gym, sauna, steam room and massage. The new management had a 50 pound introductory offer. Heron Hotel is along the river, they were the first and best gym and massage but now they have not kept up with the others. Airport View have a massage room but the Beauticians are often busy with hair. They are building a new room upstairs. Athiei beauty salon now have massage room. The new Chinese business center in Juba town has a massage room. They all charge between 70 to 100 pounds per hour for full body massage. It is advisable to choose the ones nearest your hotel.